Tucson has more than its share of upscale, fine dining restaurants, and selecting one can be somewhat of a formidable task. From the reviews I have read patrons are not likely to have a bad experience at any of them, with Tucson seeming to have a dining scene that rivals Santa Fe or other Southwest dining meccas. One restaurant that does not receive a lot of reviews is Jonathan’s Cork, a restaurant that has been established for a number of years to the point that many people may overlook it in favor of the newer, more trendy places. 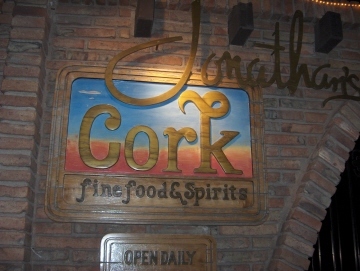 Jonathan’s Cork is not located in the foothills with a view of the city and it is not part of an expensive country club. Instead, its building in a strip commercial area does not look as impressive from the outside as it proves to be when you receive the food. If a requirement for dinner does not include a view of the city, Jonathan’s is a good choice. A comfortable bar is available as well as tables set in small rooms that allow for quiet conversation. Jonathan Landeen and his wife, owners of Jonathan’s Cork, serve enough variety to make the food interesting but try to concentrate on top quality for everything that is offered. Jonathan’s Cork is primarily a steak restaurant, but many of the entrees and side dishes are prepared with a Southwest influence. This is not the type of Southwestern food that includes green chile cheeseburgers and other concoctions that are a step away from Mexican food. These are steaks, chicken, fish, and game meats that can either be served plain or with salsa butter, appetizers that can be either traditional or spicy, and either Mexican corn soup or something more traditional. I did not find any Mexican food on the menu, but there are definitely dishes that are Mexican influenced. I have found many Mexican restaurants to serve marginal cuts of meat that are spiced up to taste better. At Jonathan’s Cork, though, the best cuts of meat are used that taste good either plain or with extra spice. You really can’t go wrong either way. Jonathan’s tradition of blending different styles of cooking began with his training as a chef in New Orleans. The New Orleans influence is also found in the food, but Jonathan has used this training not only to serve several very good New Orleans style dishes, but also to perfect his Southwestern style cooking. I am sure many restaurants in Tucson have good steaks. To me the main reason to come to Jonathan’s Cork is to take advantage of Jonathan’s creations to have a style of food that cannot be found everywhere. I tend to like spicy foods of all kinds, and both Southwest and New Orleans cuisines fall into that category. The spices here are not overwhelming in terms of heat, though, but tend to subtly enhance the flavor of the food so that it truly becomes a memorable experience. One thing I found rather surprising was that the menu does not limit what can be served, but is only a start. 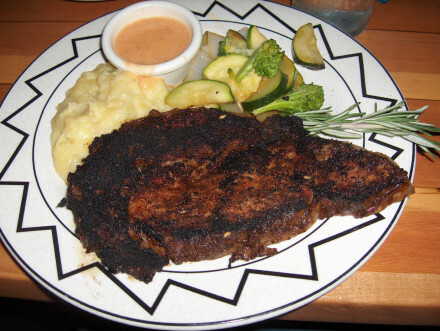 The traditional steaks are a given, and some Southwest style dishes are listed. The menu explains Jonathan’s training in New Orleans, but does not list a wide variety of New Orleans style dishes. It turns out that the menu lists the dishes that are the most requested, but Jonathan can also prepare a wide range of dishes that are not listed. If you want something that is not listed, or you want to experiment with different ways the menu items can be prepared, it is best to ask the chef. Considering the number of years Jonathan’s Cork has been operating, I really think its prime goal is to please customers and make them want to return. Nightly specials are offered, and these usually include fish. When I went one of the specials was Salmon with Lemon Butter. This was a fresh, perfectly cooked fillet with fresh vegetables and potato. By giving it a five-star rating I do not want to mislead any Pacific Northwest or other readers into thinking this was Alaska King salmon flown directly to the restaurant. The waitress stated it was farm raised, and it was definitely some variety other than Alaska King. However, it did not taste farm raised, and if the waitress was correct they must have found a way to produce better tasting farm raised salmon than in the past. The color was rather light, and it seemed to be without artificial colors that I suspect are sometimes used with farm raised fish. 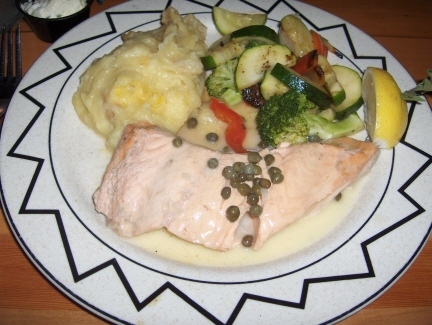 The freshness, flavor, the way it was prepared, and the sauce all made this an excellent salmon compared to just about any I have had in the Southwest, and even some in the Northwest. In fact, the Seattle area tends to have very good salmon, but very few places even in Seattle can make a sauce as good as the one at Jonathan’s. The Blackened Prime Rib was ordered as a result of Jonathan coming to our table and working with us to make suggestions. I noticed on the menu that blackening can be added to any dish, but I did not really think about ordering it on prime rib until Jonathan made the recommendation. I can tell readers that if you have the opportunity to ask Jonathan for suggestions it is well worthwhile. I was impressed that he not only made good recommendations for what I should order, but also what I would probably not like based on my preferences. Regular diners at Jonathan’s Cork probably do not need this consultation but as a first time customer, I thought it was tremendously helpful. I have eaten enough mediocre blackened dishes to recognize one of top quality as it was at Jonathan’s. I would say that if you have a craving for traditional prime rib to order it that way, but if you want something different that will provide a very pleasant surprise, have Jonathan “do his thing” with the blackening, and I do not think you will be disappointed. Although I sampled the salmon and liked it a lot, I personally thought the prime rib was the standout dish. Jonathan prepared a salsa butter in a small bowl for dipping the meat (shown in the top of the photo). I tried the prime rib both ways and although I thought the meat was good enough to be eaten plain, the dipping sauce added a flavor element that made this a very special experience. The salsa was just spicy enough to add a Southwestern flavor. The prime rib shown in the photo is the small cut, but a larger cut is also available. The one I ordered had a low fat content. The fresh vegetables were crisp and outstanding. Enough vegetables were served that I actually considered it a side dish rather than merely a garnish as some restaurants like to do. The garlic flavored mashed potatoes were my least favorite aspect of the meal. I would have preferred potatoes with less “stuff” in them and more like my mom makes. Most people seem to love them, and I have no complaints with everything else being so good. The bread was outstanding and the basket was emptied quite quickly. They probably would have brought more but it was too much of a temptation to ask for a second serving. 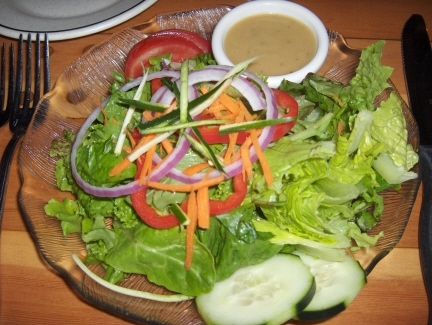 The House Salad was the ultimate in freshness, with a very good dressing. Several types of salads are available, and all look interesting. In talking to Jonathan I learned that he is able to prepare special orders of vegetarian dishes and a number of meat dishes if you either make a request for the dinner you want or you let him make suggestions. Although I was very satisfied with the food I ordered, I think the opportunity to try some of Jonathan’s other creations has to be one of the most interesting I have heard in a long time. Jonathan’s Cork pretty well has meat, fish, and game covered by the menu, but if there is something else you want it would be worth asking. It would be especially worthwhile for vegetarian dishes, which are limited on the menu. Some dishes might require advanced notice, but inquiry can be made when making a reservation. In my dining experiences I like to find things that are a little bit unusual. Jonathan’s Cork is both unusually good and unusually interesting for what is mainly considered a steak house. It is not really a New Orleans style restaurant, but Jonathan’s background in the Big Easy makes the food both better and more varied. Vegetarians do not have to be shortchanged here either. I am sure the newer, trendy places are good, but Jonathan’s Cork should not be overlooked. Jonathan’s Cork is very reasonably priced compared to comparable places I have eaten in other cities. I did not sample the wine but this is the other area in which Jonathan’s is reputed to excel. When I visited a Chinese market in Tucson the employees recommended about three Chinese restaurants in town that served good quality and authentic Chinese food. 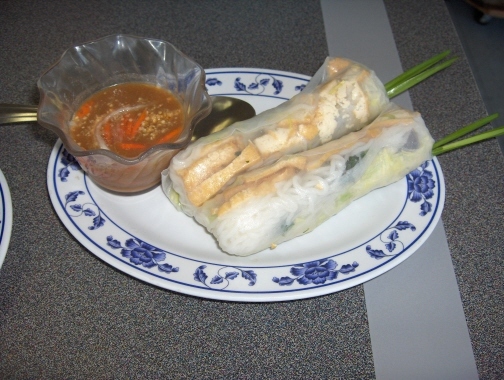 It seems to be a different story with Vietnamese food, however, with several restaurants that have been recommended both by local residents and by reviews on the Internet. One of the ones of which I had heard good things was Dao’s Tai Pan’s in the eastern portion of the city (most other Vietnamese restaurants were located closer to downtown and the University). Dao’s seems to get a lot of its lunch crowd from the neighboring hospital and medical center. While I know firsthand that not all medical personnel are particularly health conscious when they go to lunch, a growing number are choosing light and healthy Asian food for a midday meal. Dao’s is open for both lunch and dinner, but lunch is when its location seems to make it particularly popular with nearby businesses for takeout or quick meals before returning to work. The decor of Dao’s is similar to the style I have come to know from Vietnamese restaurants in other cities where tables are rather small and the emphasis is on being able to serve large numbers of people during rush times. I actually got more of a feeling of being in Vietnam than usual with decorations around the restaurant and trees outside, it is just that I would not describe the tables as spacious. Patrons are not paying for a fine dining experience but I would describe the restaurant as comfortable with good service. It seemed to be spotless clean with enough light coming in from outside that anything out of order would be noticeable. I have found some high end Vietnamese restaurants on the west coast with food selection that is more extensive than Dao’s, but outside of this group Dao’s has one of the largest menus. The food at Dao’s falls into the categories of salads, soups, noodle dishes, rice, and hot pots. Chinese food is available for lunch, but the dinner menu is strictly Vietnamese. A large selection of boba teas is available, and it looks as if they know what they are doing. Although almost all dinners fall within the budget range on my price scale, I think my normal meal would include extras that would increase the cost to the moderate range. The boba tea would surely raise the cost, but in the summer I would think few people would want to order the more economical hot tea. Spring Rolls are an item that I consider almost a necessity with Vietnamese food. I tried the vegetarian version with fried tofu and vegetables wrapped in a clear colored rice sheet. Most Vietnamese restaurants do not get this appetizer wrong, so there is not a lot of difference between them. At Dao’s, though, I particularly liked the dipping sauce that was fresh and home made. It seemed to be high on peanut content, which is common in foods from Vietnam and Southeast Asia. The Bean Curd in Clay Pot is probably the most expensive vegetarian dish the restaurant serves, costing $7.99 just for this dish alone. To properly judge the restaurant, though, (and to have a good lunch) I wanted to order the best thing I could find. This dish differed from others I have tried by having more subtle flavors, but it was in no way less satisfying. The freshness of the dish made it very good, regardless of how strong the spices were. 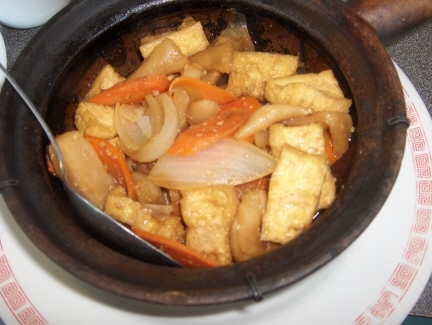 The clay pot dish came with fried tofu, a few carrots and onions, and a sweet and spicy sauce at the bottom. The contents of the pot are normally poured over rice and eaten with vegetables. I will have to say that it looked rather plain but tasted very good. I do not know if others would derive as much enjoyment out of a vegetarian dish as I do, since several clay pots are available with meat, but it is not often I find a tofu dish that provides as much satisfaction as this one. 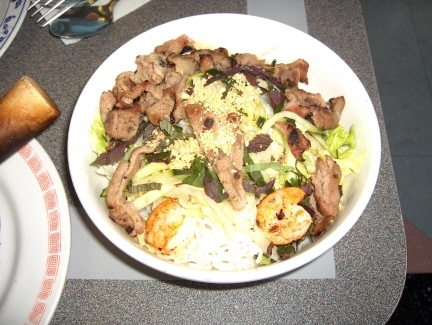 The meat dishes are also very good at Dao’s, such as the Rice Vermicelli with Grilled Shrimp and Pork that I sampled. This was the standard Vietnamese noodle bowl (but served on a plate) with rice noodles, vegetables, and cilantro leaves with fish sauce on the side to pour over the plate as desired. Like the clay pot, I found the flavors to be somewhat understated compared to the usual Vietnamese food I eat, but I liked everything about the plate including the less strong spices. The meat and vegetables were so fresh they were good on their own regardless of the spices used. The hot tea was very good, and the selection of boba teas looks very impressive although I did not try them. I don’t know if Dao’s is the best Vietnamese restaurant in Tucson, but I was certainly very impressed with it. When you factor in the cost I think it is one of the better Asian restaurants in the city for the money. I have heard that there are other restaurants in Tucson that might have better pho, but I saw quite a few people eating it at Dao’s.For me one of the big issues with pho is finding one without MSG. Dao’s uses MSG in some of the dishes, but was able to omit it from the clay pot tofu. The restaurant does not use it in the vermicelli dishes, and I do not know about the pho. The food I had did not cause any MSG after effects, so I was very happy with it. I love Vietnamese food but it is not often that I find a place where everything was as good as at Dao’s.